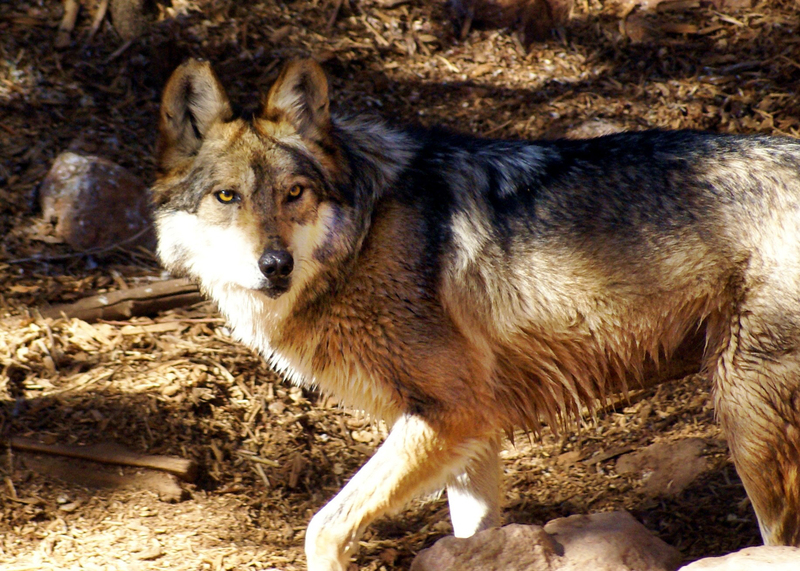 Less than a 100 yards from my office at the El Paso Zoo every day I am reminded of one of the most important missing links in the Chihuahuan Desert ecoregion, a wild predator that we all know as a symbol of wilderness and as an important apex predator, the gray wolf or Mexican wolf (Canis lupus baileyi). Prior to moving to El Paso I was active in wolf restoration efforts in Texas during the 1990s when the Sierra Club and other environmental groups helped to gain public support for the return of wolves to the Southwest at the Apache National Forest of eastern Arizona. I was greatly encouraged when I was asked to serve on the EXCOM of the El Paso Sierra Club Group when I learned that our chair, Laurence Gibson, had Texas wolf restoration on his radar screen. A new Texas Wolf Action Team offers many opportunities for people to get involved. For more information contact me by email at ricklobello@gmail.com. Prior to the war against the wolf that started in the 1800s and ended around the middle of the last century; wolves once roamed a large area of West Texas including the Davis Mountains region and the area now called Big Bend National Park. Unlike the black bear that survived in great enough numbers in Mexico to eventually repopulate parts of West Texas during the 1980s, wolf extermination efforts resulted in the extinction of the wolf in Texas about the same time it was declared endangered (March 11, 1967). The last two wolves known to Texas were killed in 1970 when one was shot from the Cathedral Mountain Ranch south of Alpine and another trapped from the Joe Neal Brown Ranch located at the point where Brewster, Pecos, and Terrell counties meet. Today we can learn much about the importance of wolves to the ecosystem by paying close attention to what is happening in places where they made a comeback. Predators like the wolf provide important ecological services in helping to control prey species like elk in Yellowstone National Park. If elk become too numerous, they can prevent the growth of certain plants. These plants, if not allowed to grow, can affect nesting sites for birds and food that other animals need to survive. Yellowstone illustrates a great example of the ecological value of wolves where their return has helped to restore willow trees, beaver and other species in the Lamar Valley. The return of wolves to Yellowstone has also had a tremendous impact on the surrounding area’s economy. A study led by University of Montana economist John Duffield showed that visitors who come to Yellowstone to see wolves contribute roughly $35.5 million annually to the regional economy. Anyone in West Texas looking to see the economy improve? Many people believe that Travis’s arguments in opposing wolf restoration are still valid today. Perhaps not, many of the large land owners who opposed predators like wolves and mountain lions are no longer with us or have sold their land to people from cities who appreciate protecting the environment as it naturally occurred prior to the first Europeans coming to America. As long as there are optimists like myself, I hope that someday we will prove them wrong. Let’s hope for the sake of wilderness and the future of humanity that the wolf will be given the chance to reclaim its rightful role in the Chihuahuan Desert. Imagine, the return of the “Grand Opera of Texas” to the dark skies of Texas. Imagine, the return of the gray wolf.